SteelSeries has been my brand of choice when it comes to gaming headphones for years now. After breaking or being unimpressed with tons of other brands, the Siberia V2 was the first one that really clicked for me. It was the perfect mix of cost, sound quality, and comfort, and I stuck with that thing for years, eventually buying another one just like it when the first finally packed in. Plenty of other people felt the same way, leading SteelSeries to try and make lightning strike twice with the Siberia V3 and 200 (which was intended to be the same as the V2s, just in different colours). Neither of them were as well received, though, with complaints about build and microphone quality making them not quite the successors to the V2 people wanted. So how does the Siberia 350, which borrows a lot of the design elements of the V2 and packages it up as a premium USB headset, hold up? 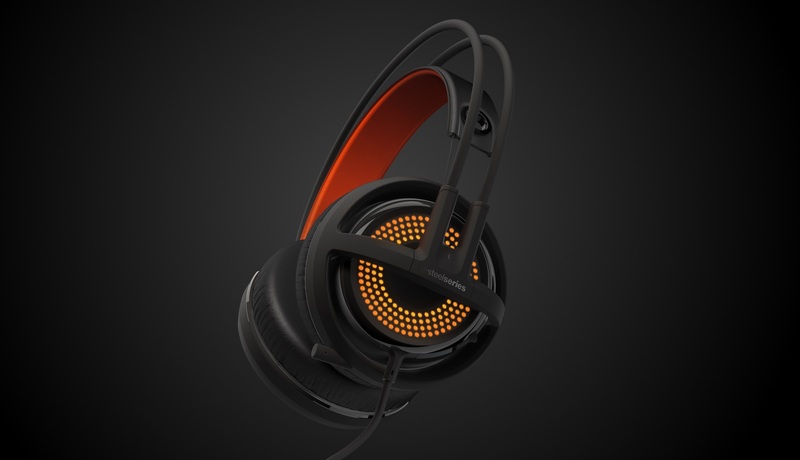 While SteelSeries still hasn’t rediscovered the brilliance of the V2, the 350 is still a neat set of headphones. The Siberia 350 is an incredibly good-looking headset. 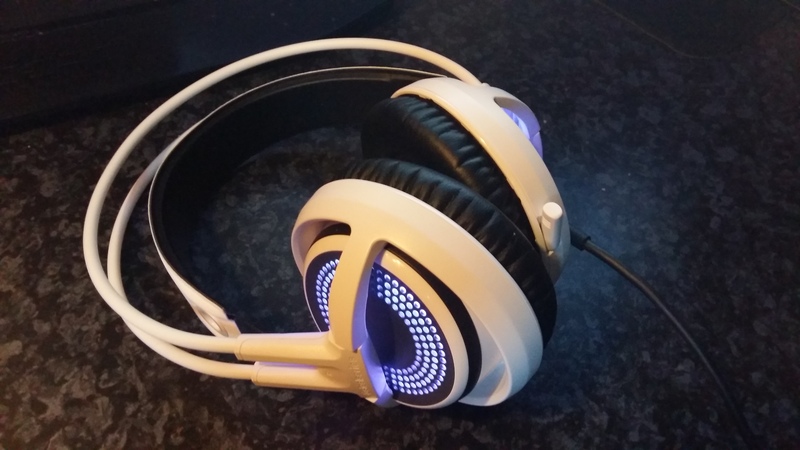 The design is sleek and simple, and the reconfigurable RGB lighting on the ear cups is really vibrant. 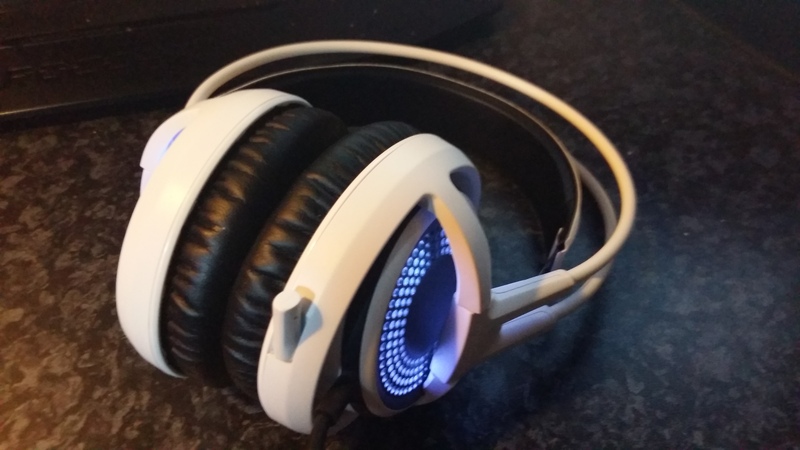 Why is there RGB lighting on a headset, when you’ll never actually see yourself wear them? No idea, but they look great when they’re sat on my desk, fading between blue and purple. As an added bonus, the microphone can be retracted into the cup when it’s not in use, meaning I’d be more than happy to wear these things out in public. That’s rare thing for any sort of gaming tech, which can often look like fallen bits of space junk. While it looks great, where it really impresses is in how comfortable it is. It’s light, the suspension band sits nicely on my head without any sort of pinching, and the padding in the cups is so soft. The Siberia 350 is, without a doubt, the single most comfortable pair of headphones I have ever worn. However, there are a couple of problems. SteelSeries claim these are designed to “keep the noise out,” which they really do not. I can still hear everything going on around me, even when the volume is up high. The opposite is also true – sound leaks out of the cups, and so everyone in the surrounding area will be able to hear exactly what you’re listening to. The only other problems I have with the physical design lie in the cable. USB headphones inherently limit which devices it can be used on without an adapter, and the cable is so, so short, measuring in at a tiny 1.5m/5ft long. While some consoles do support USB headsets, good luck actually plugging this in. The volume control wheel is also incredibly sensitive, and will majorly adjust the volume with so much as the lightest touch. The cable’s draped across my body because of the cable, and so any movement at all seems to affect the volume in some way. Much like the V2, the sound quality of the 350 is excellent. The songs I used to compare were "Bambous" by Caravan Palace and "Radioactive" by Imagine Dragons, and I was impressed by just how crisp and clear the sound was. Bass lovers may struggle a bit as the low tones are sometimes weaker than the rest, but they’re still audible and shine through in more bass-heavy songs. Mids and highs sound beautiful though which, for people like me who aren’t all too big on bass, is a great thing. In-game, the headphones benefit from their 7.1 surround-sound capabilities. I generally use Left 4 Dead 2 to test in-game sound performance because of its use of clear audio queues to signify where enemies are, and it worked amazingly. Being able to pinpoint where every infected was to a high degree of accuracy is a strange experience when I’ve been using simple stereo headphones for so long, and the 350s pulled this off really, really well. Gunshots sounded meaty and satisfying too, which goes to show these things can do bass when they try. 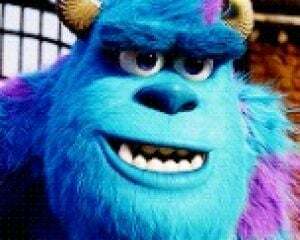 There is one problem, though: hissing. When I first received the 350s, I thought the pair I received was faulty because of an intermittent, but faint, hissing noise. It’s not noticeable at all when sound is playing through them, but in moments of silence, the hissing can be damn distracting. Some quick research suggests this could be down to a whole load of things, from the headphones themselves to the USB ports I’m using. However, seeing as the length of the cable is so short, I don’t really have much choice as to which ports I use. This might be a problem that’s fixed with a dedicated soundcard, but I don’t own one and so would be unable to test and say conclusively. The microphone’s alright, but a definite step down from the V2s. Audio recordings sound kind of flat and distorted, so while they’re perfectly fine for in-game VOIP or some basic streaming, they’re not going to get you very far when it comes to anything which requires high-quality microphones. Overall, the Siberia 350 is a good piece of kit. It looks great, the sound quality is fantastic (when it isn’t hissing), and I don’t think I could over-exaggerate how comfortable it is even if I tried. The V2 will always be king of the gaming headsets to me, and the 350 is the next in a long line of headphones that have struggled to beat it. But when your choice is between the revamped 200 series and spending a bit more on getting the 350, I’d say the style and comfort of the 350 make it a no-brainer.